New York City is as close as it ever has been (maybe as close as it ever will be) to fulfillment of a certain vision for urban utopia: cultural landmarks, sprawling waterfront parkland, and hyper-gentrified neighborhoods linked up by a single hot-button bike lane, made possible by a willful capitalist mayor and a big, fat wad of banker cash. It’s tempting, then, to pile writer Adam Sternbergh’s Shovel Ready – a novel that imagines a city brought low by exaggerated versions of all of the Great Recession’s big disasters, showdowns and near misses – on the perilously high stack of adaptation-friendly dystopian stories. The writer offers a particularly frightening view of New York to anyone who has invested in real estate here at any time since the Dinkins administration. But to anyone who is discomfited, even just a little, by the playground the city has become, the book’s a touch therapeutic. 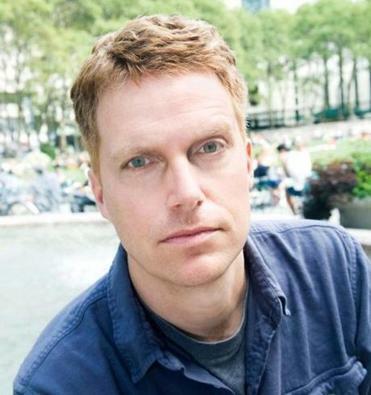 Sternbergh – a Carroll Gardens resident, and the culture editor of The New York Times Magazine – creates in his debut novel a city in the near future that has survived, if barely, a terrorist bombing in Times Square, and other attacks. Most residents flee the city, leaving behind the rich and the poor. Sternbergh’s Sandied, Occupied, Dirty-Bombed New York resembles nothing so much as a turned back clock. The streets of Carroll Gardens are pictured as lined with broken window brownstones, boarded up with rotting ply to hide all of that meticulously restored detail. Times Square is reverted to a toxic, plastic bag of tumbleweed desert, bordered by pre-Uniqlo bodegas. Even the ashen-face nurse that Sternbergh describes as dragging in one cigarette after another over a terminal patient’s bed places us unmistakably in an urban vision inflected by a post-Mad Men / pre-Giuliani wasteland. Everything that Bloomberg worked so hard to achieve (even the smoking bans) erased . . . . Which puts my question to the narrator: Is this book dystopian, or a schadenfreude’s utopia? The main character, Spademan, once (“once” meaning, from the novel’s backward looking perspective, right here in 2014 or thereabouts) lived in Carroll Gardens and collected garbage. He was a witness/victim, like virtually every South Brooklyn resident today who doesn’t own a brownstone or condo, of the Great Gentrifipression. In Shovel Ready, all that’s history. Now, Spademan lives in Jersey, and he’s a hit man. Although his personal life was destroyed by one of the dirty bombs that unraveled the city, the reader can’t help but notice a certain grim satisfaction while Spademan takes his bitter hit man beat and observes a city torn asunder. 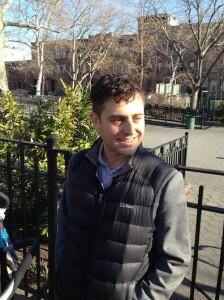 Author Adam Sternbergh of Carroll Gardens. Photo by Marvin Orellana. Spademan is right on that last point: He doesn’t excel at his job. The only murder he is commissioned to commit during the entirety of the novel never comes off, and he lacks the cunning, the foresight, and even the grotesque proportion of self-destructiveness that characterizes the most compelling noir protagonists in the urban grit genre. Whatever Spademan’s deficiencies, he’s plainly a man to keep an eye on. A film deal was sold on “Shovel Ready” many months before it’s book release date, and a second Spademan novel is already in the works. And, if purely as a dystopian/cathartic antidote to the NYT Real Estate Section Blues, the book is worth the read. Jordan Kaye is a writer and legal recruiter. His writing has been published in GQ magazine and his first book, How to Booze: Exquisite Cocktails and Unsound Advice, was published by Harper Collins in 2010. He lives in Carroll Gardens with his wife and children.